Magento Responsive Admin Template is seen as a sweet magician bringing a stylish but not less stunning performance to your web-shop. It is sure to make your Magento site more and more remarkable among others. Additionally, it is not necessary to take care whether you are a beginner or a master of this field. It is because this theme gives you the easiest accessibility on using it. 5 number of color layouts: such as Orange, Green, Violet, Blue and Teal, allowing you to cover your favorite colors for your store as you want. Just a Click to select the corresponding color; and then get Preview to see whether it is suitable for the site or not. Moreover, you can back the default admin template because Admin theme remains it. You could be sure that all core functions are stated originally and being at the same position. It just renews interfaces from pages to pages; the parent’ layout to children one and highlight buttons with tons on pages. Easy to manage Admin layout: Admin template keeps store-admin in mind because of high-customization and responsive layout with Bootstrap. It is totally easy to impress and drive 3500+ audiences in only a year with this template. It is also seen as an innovative product for our Magento Developer team lets you see the interface according to horizontal and vertical menus. These directions are an outstanding factor for you to navigate quickly and smoothly with interesting icon font. Mobile Friendly: In many reports of e-Commerce statistics, experts have admitted that Mobile online sales become the tendency hard to be ignored. The number of Mobile online retails witnesses a significant increase during these years. This certainly is true in case of Magento store. Understanding that, we submit Admin theme allowing you to adapt the Magento backend right on Mobile. In order to boost sales on Mobile, you need to have great management on this device. Admin template gives you the ability to manage your store anywhere, any when. Fully responsive: As its name, it is fully responsive and the most powerful for Magento administrators to have a perfect store. Admin theme has fully responsive admin dashboard theme which is built based on Bootstrap 3+ Framework, HTML and CSS3, jQuery. You could believe that your theme is adaptable with any page view. Clean and Clear Interface: Clean and clear performance but very attractive and easy to work. Preview Button: After you complete any configuration in the back-end, you must open the frontend in another link to view your changes. With the Admin Responsive template, you don’t need to do that anymore. Preview button is added right on the Menu tab in back-end; helping you see your changes when you finish. Ajax Search is an effective tool making the design clearer and boosting Admin experience to the maximum. Clean Code: The basic code is completely clean so you could configure or take actions in backend very smoothly as well as quickly. Attractive Charts: In the Statistic Dashboard, charts become more attractive with CSS3, HTML5 and ChartJS. 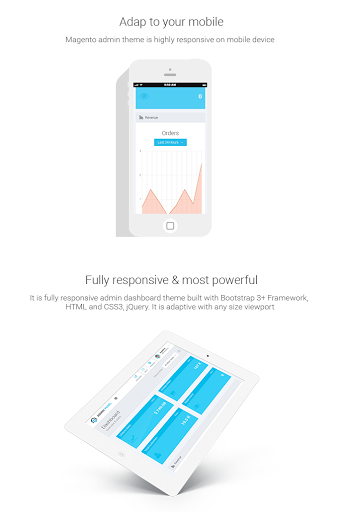 Especially, ChartJS allows you to create animated, interactive graphs on admin theme. Better Icon Fonts: Icon font attached is very Ithemify and awesome, turning your website into an endless inspiration land for administrators to do their job better. Global Translator: The translator is always available in spite of the default or configured themes. It is never the barrier for you to make your store back-end friendlier and easier to understand. Above all, this performance is not supported in any Magento theme at all. That must be Admin theme gives us the chance to show Admin avatar right on the back-end. Magento Responsive Admin Template is the MUST HAVE product if you are a Magento web-owner.